Looking spiffy, no? The red crusader goes on sale in Japan later this June for 10,584 Yen (about $97.48). Source: Hobby Dengeki Thanks to Vhyper1985 for the tip! nice, but i'd love to see xplus for characters other than zero, x, or those of the classic series. hopefully one day we'll have some more figurines for smaller series/more minor characters. Fixed that for you, because I know you're not stupid enough to think a toy manufacturing company would end an entire line of successful products because of one unsuccessful one. Unless you mean to say Zero is the only character left after Classic, X, X-Zero, Roll an oddball villain every now and then, and maybe possibly probably sorta Protoman to really make an impact? true. i'm not a huge fan of battle network but i appreciate the fact that sentinel is putting out more figures for other characters that only have customs/old action figures. variations are nice, too. i just hope that we get some more starforce and zx figures in the future that arent wonderfest customs/garage kits. i'm hoping for command mission too, even though the later is unlikely. as for kotobukiya, im hoping they continue their line of megaman figures one day - the manufacturing costs seem to be cheap enough (correct me if im wrong on this, though.) and the kits are pretty easy to put together and look quite nice. i agree with anon, though, i dont think zero really 'ended' any of the figure lineups. im just surprised that capcom has never made figure sets/lineups of all the megaman protagonists and antagonists. even small figures would be nice, but i guess that's just wishful thinking. Actually they did end with Zero series Zero, its been what over a year now since we gotten any or heard of anything of them continuing the line. That's all due to Zero series Zero not selling well. It really is. A lot of fans were saying to continue doing X series characters or Classic characters, but you all voted for Zero series Zero? He won the poll but he did bad in sales. Its like put your money where your mouth is. You guys speak you wan this and want that but no one buys, and its the company that looses money so, why continue. Yeah everyone knows it ended with MMZ, people are saying it is highly unlikely that it ended because of it. How do you know "it really is"? There is no way. MMZ Zero=bad sales. Oooop End it, end it all. I mean we could always go back to our previously successful series of characters, and treat the Zero series as if it were a separate series, but let's Just end everything Mega Man/Rockman. PUT AN END TO IIIIIT!!! No, it's way more likely that Mega Man in general doesn't sale that well, like its games. Only difference is the toys don't have someone on the inside pushing for it even though the returns are mediocre at best. Until you have actual sales figures you don't know what "it really is". Let me Guess, MMZ ended the Archie comics too because he was in the latest issue even though they announced the discontinuation of the series before that? Pfft! Ask Bandai themselves, Zero series Zero didn't sell well nor did Bass either. People want this and that but no one bought them, its like if you looked around you can still find Zero series Zero still available on some places. Its like put your money where your mouth is, speak with your wallet. Never been a big fan of MMZ, Zero is at his best in X4/X5. I hope they do more classic series, those are the ones I want. A Dr. Light would be cool, to go with my Rock and Roll. Rush and Tango would be cool, Tango never get's any love. That's just wishful thinking, there is no way, none, that a legit toy company would invest in making Tango, well not standalone anyway. The day that happens is the day I think a traditional style Mega Man game will sale over 20 million units, which suffice to say will never happen in my lifetime. X-plus Toys giant Aile, Leviathan, Megaman Volnutt next! Yup, nothing else to sale for a profit, might as well end. MML boring? Clearly you never played the games. If it was boring how else did we get two games and a spin off one on the side too? "Clearly you never played the games": Played and beaten MML, MM64 and MML2 several times. To fairly judge them they are not that great, and boring in the sense you put it. I wasn't talking about boring quality before, I was saying nothing is going on for it, like figures, games, comics animation etc etc but yeah the games are boring too. Mostly super mellow music, tank controls, fetch quests all over... all it has is the invention of third person lock-on (cool invention yes) and a homey feel to those that love the characters and world. "If it was boring how else did we get two games and a spin off one on the side too? ": Uhmm... Not sure how sequels relate to being boring or not, but Keiji Inafune. Thank him. As for the side game, Tron Bonne. Thank her, who also so happens to be more popular than the series she comes from I'd say, don't ask me why. I love the Zero series. Such a great series. But not a fan of X-plus. Theres statues none the less. I like my figures to be articulated. I'm ok (not happy as it could of been done way better)with the SH Figuarts version of it. I hope this doesn't kill the line as how Zero series Zero has a history thus far of it killing lines. 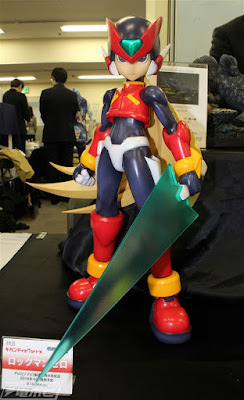 What they could of done is a Protoman, Rush or Bass to go with their X-Plus Megaman, but it seems theyre jumping ahead to the Zero series like how D-Arts and Kotobukiya did and it just ended bad and resulted in killing the line.